With tons of new features in the new Hotmail, the Hotmail team is committed to making Hotmail the world’s best email service. Microsoft has now decided to aggressively market the Hotmail brand and launched a new website has been launched for the same. There are no official statistics available for the exact number of users for different webmail services but in US it’s the Yahoo! mail and Windows Live Hotmail contesting for the top spot followed by Gmail users. With all its cool features, the new Hotmail can really take on any other mail providers and its now decided to take Yahoo Mail head-on. The new Hotmail helps protect you from hackers in more ways than Yahoo! – The new Hotmail provides an encrypted connection during your entire session to help guard against hackers. Yahoo! provides an encrypted connection only at certain times like login. Up to 50% Fewer Ads than Yahoo! View and Edit Office docs right inside your Inbox – Hotmail lets you view and edit Microsoft Word, Excel and PowerPoint documents from virtually any PC – without leaving your inbox–for free. You can’t do this with Yahoo! Share 400x the amount of photos and files in one email- Share up to 200, 50 MB files (10 GB) in a single email using SkyDrive. The most you can send with Yahoo! is 25 MB per message. Easier to Sweep out junk mail – The new Hotmail includes Sweep, a virtual broom that helps you clean up old messages in your inbox. It can also automatically file away or delete messages you receive from specific people or businesses.Yahoo! offers filters which you can set up manually, but they don’t help you get rid of unwanted messages that are already in your inbox. It also says everyday people are switching from Yahoo! mail to Hotmail and provides very convincing reasons and the features of the new Hotmail justifying it. And then it goes on to provide some tough questions related to Hotmail and provides answers to it. If you haven’t given a try to the new Hotmail , you should and you even don’t have to abandon your old mail ID. Hotmail with its cool new feature provides the ability to receive and send e-mails from other addresses, including ones from Gmail or Yahoo! Mail [Plus]. For example, you can send and receive mail from yourname@gmail.com or yourname@aol.com using Hotmail. You can also check out this post on how to migrate from any email account to a Hotmail account. The site also provides a counter continuously ticking and showing the total number of people that have signed up for the new Hotmail since Sept. 2010. 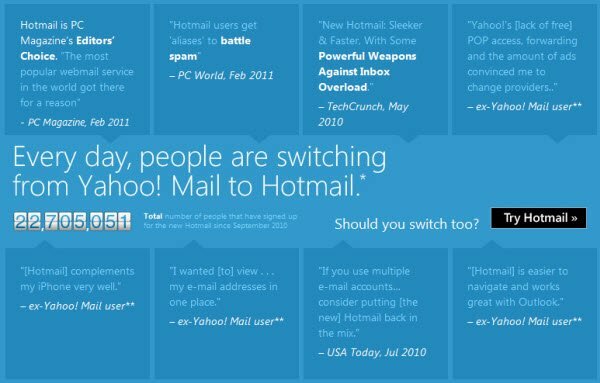 Visit and check the details for yourself, why you should switch to the new Hotmail at SwitchToHotmail.com. Any Hotmail or Yahoo Mail users here? Would love to hear what you have to say about each of these mail providers. How to migrate from any email account to a Hotmail or Live mail ID easily, may also interest you.